If you’re sitting on a bunch of bitcoins that are burning a hole in your digital wallet, you now have another way to spend them. Today, mobile gift card company Gyft has partnered with BitPay to start accepting bitcoins within its app. This is a big partnership for both, as BitPay’s CEO, Tony Gallippi, says that the company currently processes $5 million per month in bitcoin transactions for its merchants. 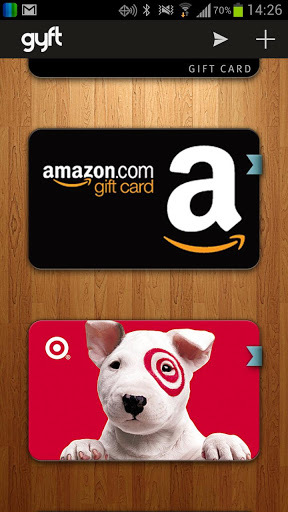 Gyft allows you to purchase gift cards at more than 50,000 retail locations in the U.S., including Brookstone, Lowe’s, GAP, Sephora, Gamestop, American Eagle, Nike, Marriott, Burger King and Fandango. So, technically, you’ll now be able to use bitcoin to pay for a Whopper. That’s progress, right? The new bitcoin payment option is only available on the Android version of Gyft, but is as easy as choosing your choice of payment once you’ve chosen the gift card that you want to buy. Simply pick bitcoin and then use your wallet to pay for it. This means more purchase activity within Gyft, as well as setting itself up for the future, in case bitcoin were to go mainstream: “Gyft is proud to be a pioneer in the bitcoin universe and we are excited about the possibilities for further innovation on our platform,” said Gyft CEO Vinny Lingham. TC: Are these the types of deals that you’re focused on now to make bitcoin mainstream? Will there be more like the Gyft announcement coming? Gallippi: We are looking for ways to increase business acceptance of bitcoin. Most retail point-of-sale systems are legacy, and so integrating bitcoin would take some effort. However, if we can easily convert bitcoin into a tender that business can already accept, that will help drive bitcoin adoption more quickly. TC: How long do you suspect it will take until the average consumer gets educated on bitcoin and uses it? Gallippi: Bitcoin is hard to use today, and that’s a good thing. There are still bugs and it is too risky for the average consumer. The infrastructure of bitcoin cannot handle hundreds of millions of users at this time, so a gradual adoption is better. TC: What are some of the hurdles that stand in the way of mainstream bitcoin usage? Gallippi: It still is difficult to purchase bitcoins. This would be easier if banks were more accommodating to let people choose what do to with their own money. Bitcoin is voluntary; you don’t have to use it if you don’t want to. TC: Since this lets you convert into a gift card, how long do you think it will take to be able to make direct purchases using bitcoin? Gallippi: E-commerce will adopt new direct bitcoin payments faster than retail, since e-commerce already has payment gateways in place for software-only payments. TC: How do you feel about the recent stories of DDOS attacks that have affected bitcoin and how that’s perhaps scared some people away from the currency? Gallippi: Bitcoin companies suffer from DDOS like all banks do. However consumers actually are inconvenienced less with a bitcoin wallet DDOS. With your online banking, if your bank is down, you cannot access your money. However with bitcoin, if you are in control of your private keys, if the wallet you use is down, you can upload your backup into a different wallet that is up, and have immediate access to your funds. That is possible with bitcoin, but not possible with any other type of traditional bank. The fact that it’s Android-only shows that we’re still a long way off for bitcoin in the mainstream. It’s going to take a lot for Apple to one day accept any type of wallet integration into its own apps. For bitcoin, this is a big step forward, as real goods and services can now be purchased using them, even if it’s relying on a gift card as the middle man.